Epinephrine, not Benadryl®, is the first line of treatment for severe allergic reactions. These numbers are significant. School is a common place for children to experience anaphylaxis – a serious allergic reaction. That fact is why most U.S. states now have policies allowing schools to stock epinephrine, thanks to the School Access to Emergency Epinephrine Act. Their new policy does not apply to students with documented allergies who have their own prescriptions for epinephrine auto-injectors. But it still puts the district’s school children at risk. Every minute counts when a severe allergic reaction starts. 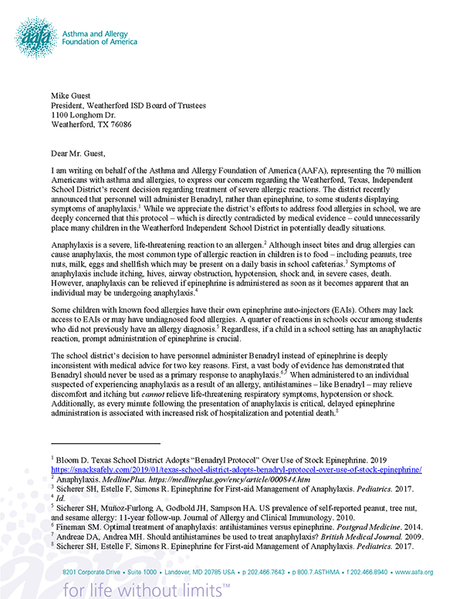 If a child has an allergic reaction and doesn’t get epinephrine right away, they are at risk of being hospitalized, or in severe cases, death. The Weatherford Independent School District says they feel that they can’t have someone trained to give an epinephrine auto-injector during all times the school is open. But training is quick and simple. And there are many resources available to help anyone learn how to use one. Learning to use an epinephrine auto-injector only takes a few minutes. 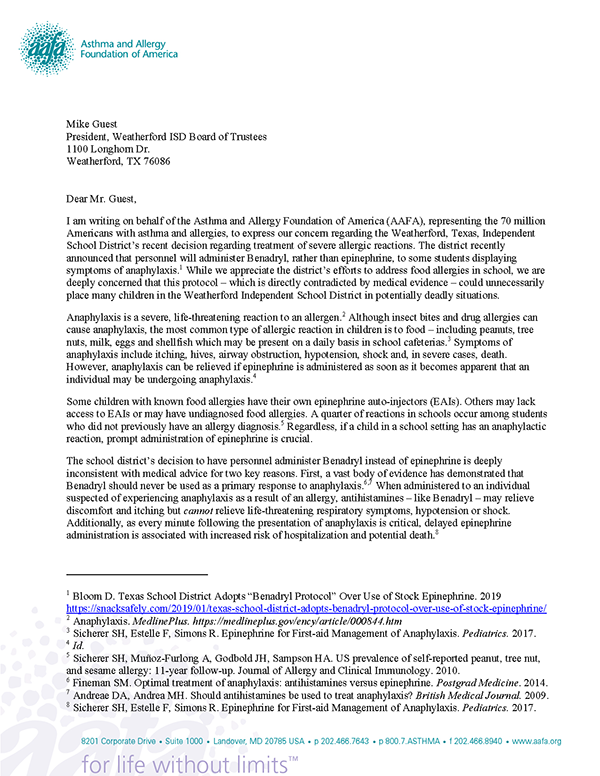 The Asthma and Allergy Foundation of America (AAFA – Kids With Food Allergies is a division of AAFA) has sent letters to the Weatherford Independent School District urging them to change this policy. We offer our help to provide them with the right resources or access to local experts who can help them change to a policy that looks out for the lives of their staff and students. We also plead with other school districts, child care centers and after-school programs – any institutions who work with children – to not follow the example of the Weatherford Independent School District. Stocking and using unassigned epinephrine is possible, practical and life-saving. Read our letter to Mike Guest, president of the Weatherford Independent School District Board of Trustees. 1 Sicherer SH, Furlong TJ, DeSimone J, Sampson HA. The US Peanut and Tree Nut Allergy Registry: characteristics of reactions in schools and day care. J Pediatr. 2001;138(4):560-565. 2 Sicherer SH, Estelle F, Simons R. Epinephrine for First-aid Management of Anaphylaxis. Pediatrics. 2017. 3 Fineman SM. Optimal treatment of anaphylaxis: antihistamines versus epinephrine. Postgrad Medicine. 2014. 4 Andreae DA, Andrea MH. Should antihistamines be used to treat anaphylaxis? British Medical Journal. 2009. Join our community to follow our blog for the latest news on food allergy research and advocacy. Our community also provides an opportunity to connect with others who manage these conditions for peer support. My kiddo is in this school district and having interacted with these schools I'm guessing the problem is more complex than the article has let on. The following is my speculation as a parent. The reason given in the article "The Weatherford Independent School District says they feel that they can’t have someone trained to give an epinephrine auto-injector during all times the school is open." Isn't just regarding the inconvenience of training - all the teachers and admins go through the training. The issue is really access to the epinephrine which is locked in the nurses office. Our nurses are contract employees (as I understand it) and the nurses offices have limited key access. They also have to follow different access requirements because of also housing student medications and medical records. So to have a trained person on staff and authorization and keys for entry to the nurses office is a different bag of chips. The school buildings are used outside of school hours by outside groups as well. Your now talking about keeping a specialized staff member in the building for over 12 hours a day most days. Benedryl being an OTC drug (and cheap) can be stored differently and in more locations. Our district also (and I've seen the numbers my self) has a very low rate of allergy. Having benedryl is better than having nothing - which is the past practice. I have always authorized the nurse at my child's school to use her epi if it would save a life. While I appreciate the work of this group the expectation that schools stock a serious medication like epinephrine that is crazy expensive, results in hospitalization, and has serious side effects is unrealistic. Administering benedryl and calling the paramedics is a reasonable response I think. This is such BS. It takes a school nurse 30 minutes to train staff. More is better, but that is all they need to know how to use the auto-injector. On top of that, if they choose to supply with Auvi-Q the auto-injector has audible instructions when you pull the cap to walk anyone through how to use it. They are worried about being on the hook for an unnecessary hospital visit, but is the potential death of a student really worth the risk? This is a scary situation. Thank you for your advocacy!